Save time and resources by using a water sensor to automatically adjust your system to the weather. At first glance, watering seems simple enough. Water, rinse, repeat. However, there are a number of variables to consider to minimize waste, prevent pest and disease problems, and generally get the job done right. Here, landscape professionals weigh in on the best ways to water your lawn and landscape. Water only one inch per week. 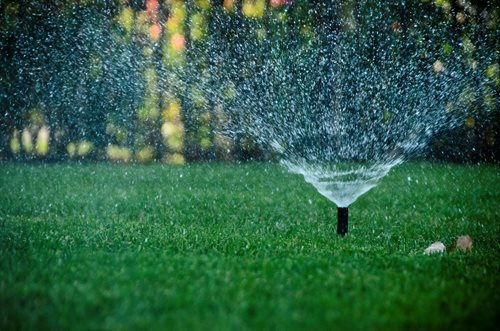 Many people run their sprinklers for an extended period of time, but in most parts of the country, horticultural scientists recommend only one inch of water per week. You can bury a rain gauge in the lawn to see how much water your system is actually using each week, and adjust your irrigation timer from there. Minimize sprinkler overspray through careful design. Minimize overspray. There’s nothing more annoying in the midst of drought than to see a stream of water draining off the pathways surrounding a lawn. Often a simple adjustment to your irrigation heads can reduce or eliminate overspray. However, some lawn shapes are harder to irrigate than others. “Square and rectangular shapes are the easiest to irrigate effectively, while curved lawns pose more of a challenge,” says Jeremy Walla of Aspen Ridge Lawn and Landscape in Rapid City, SD. The best solution is to design your lawn borders at the same time as your irrigation system to make sure you can water without runoff. Consider using drip irrigation on turf. What? Drip irrigation to water a lawn? This untraditional approach is gaining in popularity, as it’s a simple way of reducing water use. “Anytime you spray water into the air as a way of irrigating, you’re losing 50-70% of it depending on weather conditions,” says Evans. “We use underground drip from Netafim for all applications.” While most types of drip irrigation system should never be buried, Netafim uses special technology to prevent clogging and repel roots, so it can be used effectively underground. Check your sprinkler system application rate easily with the use of standard household coffee mugs. 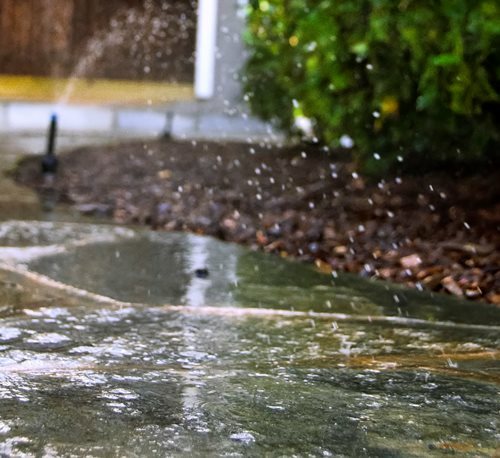 Scott Cohen of The Green Scene in Northridge, CA suggests setting mugs across the lawn or planter areas and running the sprinkler system for about 15 minutes. Check the amount of water that has landed in each cup. Adjust sprinklers as needed to provide even fill-up of the mugs. Mow taller. Each added ¼" of cutting height adds about 25% more leaf area to upright growing grasses. Leaf area is the key to a plant's ability to gather sunlight, produce carbohydrates, and grow deeper roots. Taller mowing leads to more "flesh" to support wear, more leaf to supply food (for grazing pets) and deeper roots to improve salt tolerance and more rapid recovery from urine damage. Water deeper and less often. A general rule is to water the equivalent of an inch of rain, but only as often as necessary. The idea is to promote the healthiest, deepest rooting turf possible under given conditions. Watering less often promotes natural aeration and reduces compaction. "Session Irrigation" = Water like rain. This term reflects the need (in clay soils) to irrigate "like rain," which is characteristically long and slow, an inch of rain occurring over several hours in a moderate storm. Typical pop-up spray-nozzle sprinkler heads used in residential landscaping apply an inch of water in only 20 minutes. That's the equivalent of a huge downpour or cloudburst! This often results in too much run-off as the lawn, and soils in some communities don't absorb the water fast enough. To improve water penetration, try something pros like golf course superintendants use called "session irrigation," several shorter watering sessions one hour apart. The time between watering allows for water to soak in deeper, encouraging deeper root growth and salt leach. 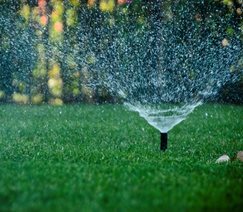 Set your sprinkler timer to session-irrigate until about an inch of water is achieved, but only water as often as necessary. Remember, allowing the soil to dry between watering helps aerate the soil and encourage healthy deep root growth. Clean your nozzles at the beginning of each season Most sprinkler head nozzles have an inset filter to remove debris that gets into the main sprinkler lines. These screened plastic filters help keep the nozzle clear, but require cleaning regularly to keep water flow even and reduce clogged heads. Clean once or more each season, unless you live in an area with poor water quality, to keep those nozzles free and clean of debris. Sharpening your mower blade saves water. A sharp blade makes a clean cut on the grass blade, and the leaf heals quickly. Dull blades leave the top shredded. The tattered leaf blade requires more water to heal the wound and is much more susceptible to disease and insect activity. Remember it is survival of the fittest out there! Insects and disease choose to infest the suffering damaged lawn before the clean cut healthy one. To reduce water and pesticide use, be sure to sharpen your mower blades every 20 hours of use. For many residential lawns that equates to about 20 weeks of mowing, but for a maintenance gardener that blade could need sharpening twice a week! Less broken sprinkler heads. 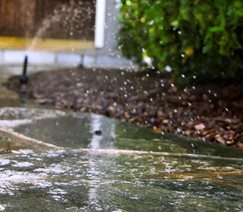 Active kids and dogs can create a nightmare for sprinkler systems! As they run through the garden they can knock into sprinkler risers and break the fittings and pipes below. Many homeowners have been frustrated by frequently broken sprinkler heads, lines, and pipes from a rambunctious child or pet. The simple solution is to modify your sprinkler installation method. 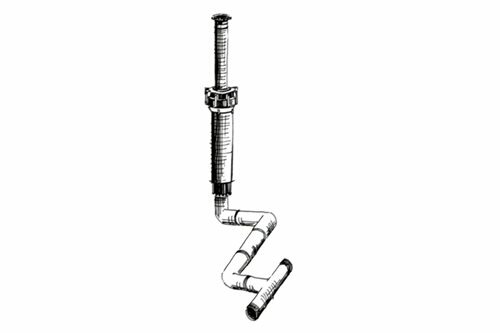 Use a "swing elbow" configuration on our sprinkler system installations. Instead of mounting sprinkler heads directly into the top of the fitting, turn your fittings sideways and mount sprinklers on a series of threaded 90 degree elbow fittings. (See diagram for clarification.) 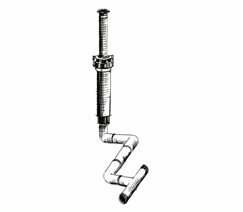 Following a swing elbow sprinkler configuration will reduce your broken heads and make repairs easier when one gets broken. When a sprinkler gets hit it will simply fall over instead of breaking the head, which can be easily adjusted by hand later. Hillside water saving tip. When irrigating sloped areas it is better to use "low precipitation rate" sprinkler heads, like rotor-streams instead of spray heads. Rotors will apply water at ¼ the rate and allow water to soak into the root zone instead of just run off down the slope. Spray heads apply water 4 times faster than rotor heads and water runs off and goes right down the drain! Since rotor heads apply water at ¼ the rate, then you need to leave them on 4 times as long as spray heads to apply the same volume of water. Update your drip system annually. “As plants grow, their watering needs change,” explains Evans, “and most watering systems waste water.” Once a shrub or tree reaches a mature size, it can often thrive with little or no supplemental water. It’s also a good idea to move drip emitters further away from the trunk each year, as plants soak up water and nutrients most effectively at their drip line, the outer edge of where the plant’s leaves are. By carefully designing your watering system and checking it periodically to ensure it’s running efficiently, you can save water and have healthy, disease-free plants.